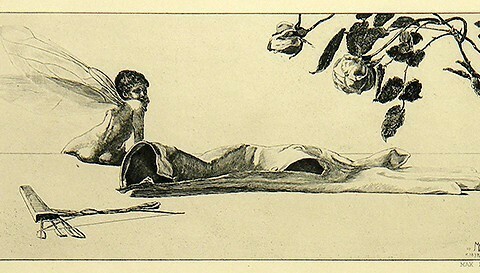 In a portfolio of ten prints, Max Klinger (1857-1920) traces the journey of a single white glove in a nightmarish landscape where the glove consumes the mind of the man who first found it at a skating rink. The German artist published this series, entitled Paraphrases on the Finding of a Glove, in 1881. In creating these prints, Klinger was particularly affected by two Romantic artists: France’s Caspar David Friedrich and Spain’s Francisco Goya. While the series starts off firmly grounded in the real world, it quickly ushers the viewer into outlandish and guilt-laden otherworldly settings. These images are infused with a self-consciousness and dark distress, evidence of Klinger’s modern approach to the subjectivity of art. Although Freud and other psychoanalysts would later develop whole theories surrounding human sexuality and the subconscious, the possible fetish and symbolic meanings of the glove are clearly testimony to Klinger’s forward-thinking nature. The male protagonist of the series begins this journey at a skating rink where he picks up the fallen glove of a woman. He is either unable to return the glove or chooses not to, and later weeps with remorse before the glove and a woman in the distance. Throughout the next prints, the glove oscillates between periods of vulnerability and conquest. It is almost consumed by the wild sea, yet the protagonist successfully saves it. The glove then amasses more control and dominance over nature, especially the sea. But in a strange twist of events the glove is whisked away by a mysterious and terrifying animal while the protagonist’s outstretched hands reach through the window. The story concludes on an ambiguous note with the disproportionately large glove lying on a surface next to an unusually insectile Cupid, leaving the viewer to wonder about the glove’s significance and the eerie dream sequence. The portfolio’s many reprintings in the 20th century attest to its importance among art movements such as Surrealism, and to the enduring legacy of Klinger’s work for artists interested in the intersection of fantasy and reality. Klinger was, in the words of Giorgio de Chirico, an exemplary modern artist “in the sense of a man of awareness who feels the heritage of centuries of art and thought, who sees clearly into the past, into the present and into himself.” De Chirico, along with other 20th century artists including Käthe Kollwitz, Edvard Munch and Salvador Dali, were all influenced by Klinger’s unique style and his scrutinizing look at the fantastical dimensions of contemporary social life.